Note: This poem was written on L.S.D. in Ibiza, Spain, in 1970 during the U.S.A. war in Vietnam. If you visit Vietnam, no one calls it the “Vietnam War,” it’s universally acknowledged as the “American War.” I imagine the same is true in Iraq and Afghanistan. Calling the wars by the invaded countries’ names creates a dangerous linguistic displacement of responsibility and disallows an essential connecting of the dots to show that there have continually been American Wars for decades, already for over a century. Americans keep discussing peace and anti-war efforts, but I believe that nothing would scare most Americans more than 20+ years of continual peace. Imagine the weaponry that couldn’t be tested on actual battlefields. America will not stop making wars, because its military edge would be put into question, and which party or vested interest would approve? In the near future, Americans will have to learn to live with the U.S.A. at war as I have for most of the past 50 years. Despite the desire for peace in many citizens, historically, anti-intellectualism and brute violence have always been hallmarks of America’s real politik “exceptionalism” on the world stage. 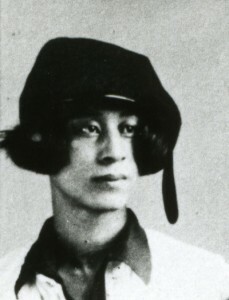 Kitasono Katue, mid-1920s, photographer unknown. John Solt collection. © Hashimoto Sumiko, 2013. Used with permission. from where a truly wretched peace was born. loveable city people have perished. nothing but a mob covered with rags. tearfully gnawing on hopeless bones, what else to do? to make this stupid century pass even I moment sooner! Kitasono Katue poetry, © Hashimoto Sumiko, 2007. English translations © John Solt, 2007. Used with permission.